1. Try to create a bedtime routine for your newborn as soon as possible, as babies respond well to consistency. Keep it short and simple: bath, nappy, pyjamas, feed and a story. 2. Allocate an hour before bedtime to an energetic activity. Put baby in a bouncer or let them explore a playmat and they’ll soon tire themselves out. 3. This should be followed by a relaxing bath to calm baby down. The warm water will soothe them and help them to unwind. 4. A change of nappy and a clean sleepsuit are essential before bedtime. Your Baby will fall asleep more easily if they’re comfortable. 5. Always give your baby a feed before putting them down to sleep. Warm milk is comforting and will stop them from waking up too soon due to hunger. Daytime feeds should be social and lively, while nightime feeds must be kept quiet. 6. Keeping lights dim in the evening will help Baby distinguish between night and day. It’s also important to keep your baby’s room quiet at bedtime, so remove any distractions such as tvs, telephones or toys and speak in low voices. The room temperature should be around 18?C. 7. Read a story at bedtime as your baby will find the rhythm of your familiar voice calming. It’s also a good idea to keep a baby blanket or teddy with you for a while so it gathers your scent. This will be a source of comfort to your baby throughout the night. 8. Stick to the same elements, in the same order, with the same people, every night. 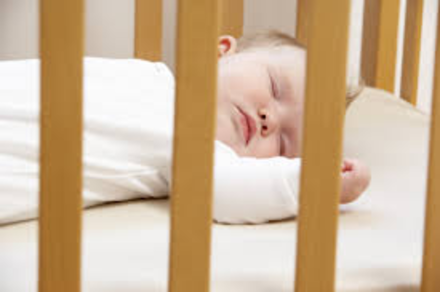 At the same time every night give your baby lots of cuddles and then lie your baby on their back on the mattress in the cot. Then give your baby a chance to discover that they can go to sleep on their own. 9. Newborns usually sleep for around 17 hours a day, but normally for only four hours at a time. So comfort your baby when they wake and then settle them again. 10. If you are struggling to send your baby to sleep, persevere with reassuring cuddles. However, if you’re feeling overwhelmed and stressed leave the room for five minutes to have a break.